Dependable insect and rodent control since 1953. Pest free living. No springs, no snaps - no hurt fingers! Ready to use/no bait needed. No poisons. 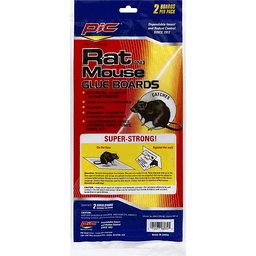 Disposable - discard rat or mouse with glue board. For apartments, homes, factories, mobile homes, boats, etc. Super-strong! On the floor. Against the wall. Contents: 2 super-strong disposable glue boards. www.pic-corp.com. Made in China.